Pumpkin Sheet Cake is the ultimate taste of fall! Light, fluffy pumpkin cake topped with cream cheese frosting and a twist of maple syrup. This Pumpkin Sheet Cake is easy to make and ideal for feeding a crowd. The perfect dessert for Thanksgiving or any fall gathering! Let’s talk about pumpkin desserts for a second, shall we? Because it’s that time of year…and there are SO many delicious ones to choose from. And to be honest? I love them ALL. From Mini Pumpkin Cheesecakes to Pumpkin Pecan Pie Bars to Pumpkin Spice M&M Cookies…there’s something about pumpkin in fall that just. feels. right. Or maybe even necessary. 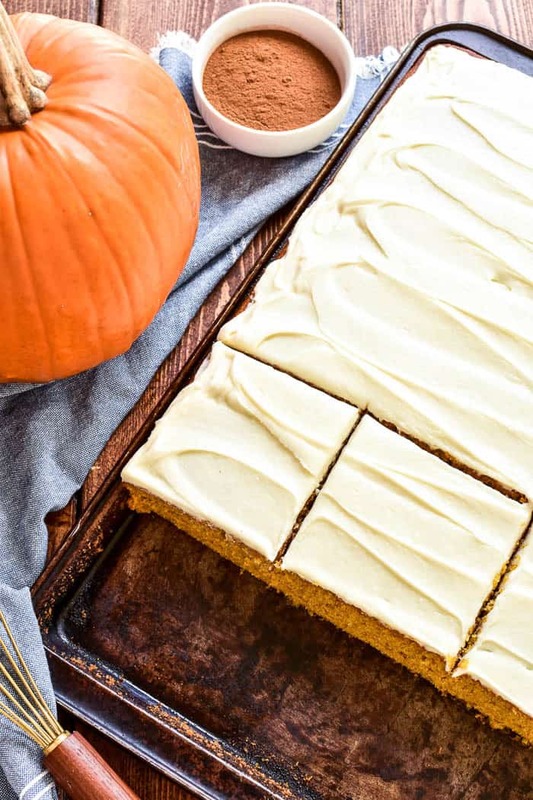 And this Pumpkin Sheet Cake with cream cheese frosting? Well, it might just be my favorite. 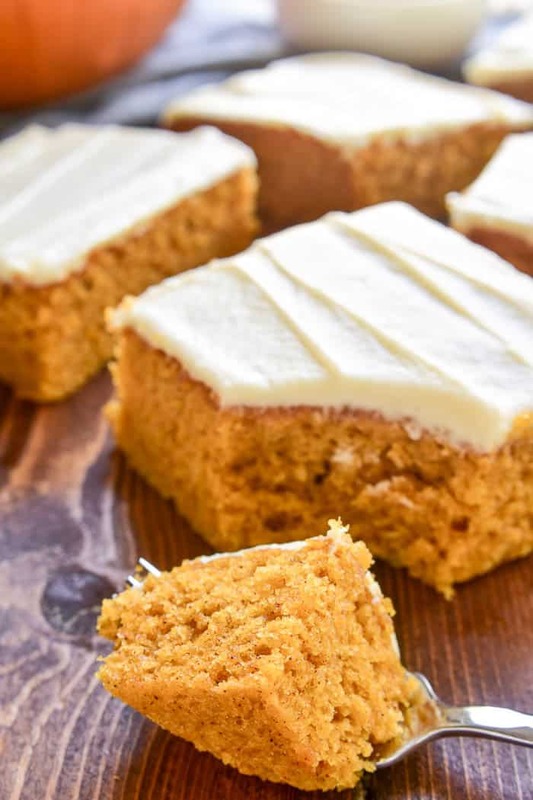 It’s light and fluffy and packed with delicious pumpkin flavor, and the cream cheese frosting is THE BEST. I’ve always been a fan of cream cheese frosting. It’s the frosting I use on my favorite cupcakes and the frosting I would choose over any other kind. Every single time. And since pumpkin and cream cheese were clearly made for one another, it was the obvious choice for this pumpkin sheet cake. I decided to mix things up a bit with the frosting and the cake by adding a touch of maple syrup to both. Let’s just say I absolutely fell in love with the end result. Because if the combination of pumpkin + cream cheese is delicious…the addition of maple takes it to the next level. 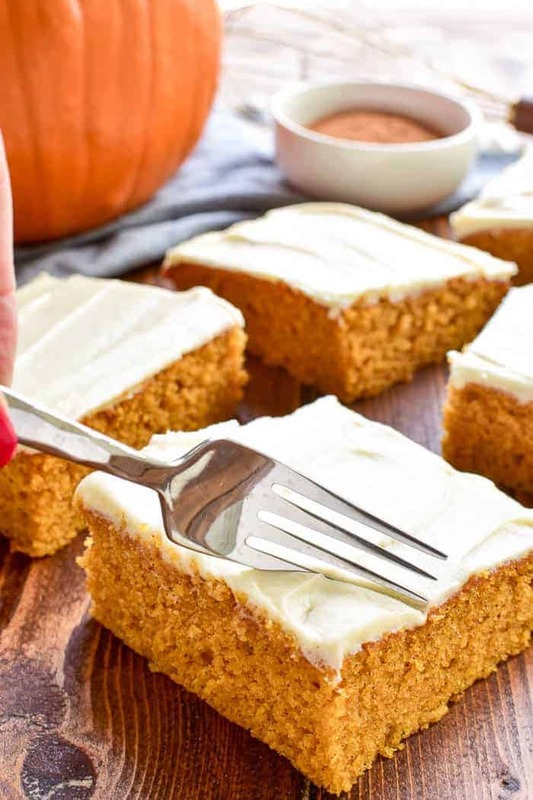 But the BEST thing about this Pumpkin Sheet Cake? Everyone loves it. And when I say everyone…I really do mean everyone. HOW DO YOU MAKE PUMPKIN SHEET CAKE? In a large mixing bowl combine 1 c. oil, 1 15 oz. can pumpkin puree, 1 3/4 c. granulated sugar, and 1/4 c. maple syrup. Slowly stir in 4 large eggs. In a separate bowl, combine 2 c. flour, 1 tsp. baking soda, 2 tsp. baking powder, 1/2 tsp. salt, and 2 tsp. cinnamon. Add to pumpkin mixture and stir to combine. Pour mixture into a greased jellyroll pan. HOW DO YOU MAKE MAPLE CREAM CHEESE FROSTING? In a medium mixing bowl combine 3/4 stick unsalted butter, 4 oz. cream cheese, 1 3/4 c. powdered sugar, and 3 Tbsp. maple syrup. Spread frosting over cooled sheet cake. WHAT SIZE PAN DO YOU USE FOR SHEET CAKE? Sheet cake is baked in a jellyroll pan, which is typically 15 x 10 x 1 inches. This cake can be baked in a slightly larger pan, as well, although baking time may need to be adjusted. HOW MANY PEOPLE DOES SHEET CAKE SERVE? This Pumpkin Sheet Cake will serve approximately 24 people, depending on the size of the pieces. 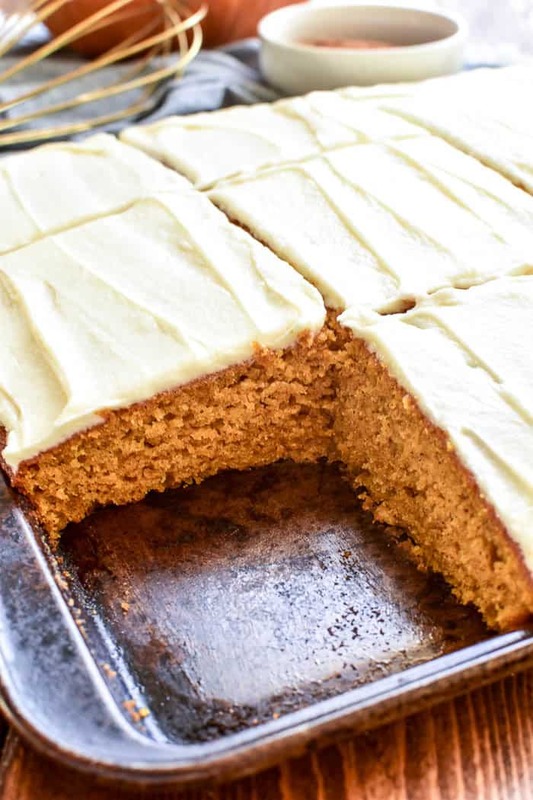 Pumpkin Sheet Cake is the ultimate taste of fall! 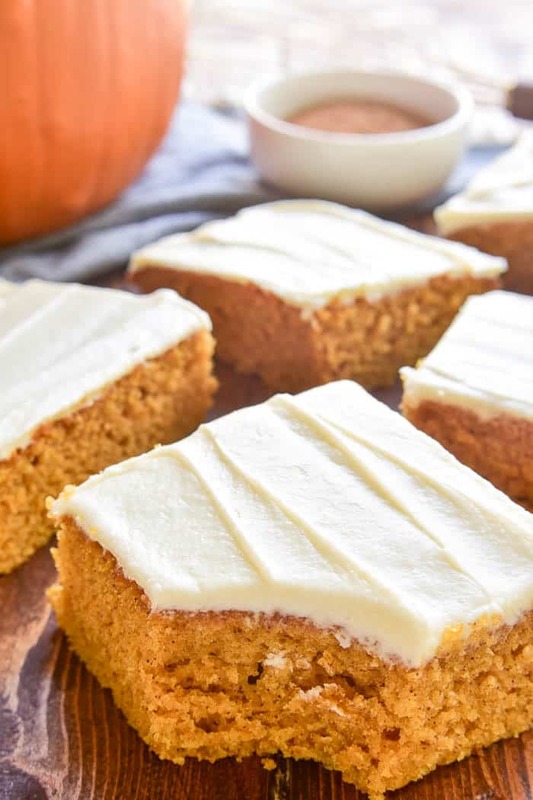 Light, fluffy pumpkin cake topped with cream cheese frosting and a twist of maple syrup. This cake is easy to make and ideal for feeding a crowd. The perfect dessert for Thanksgiving or any fall gathering! For frosting, combine ingredients in medium mixing bowl and mix 2-3 minutes or until smooth and creamy. Spread evenly over cake. This is an amazing recipe. I can’t wait to try for the family! How this looks so delicious I can’t wait to try it! I love how moist it is! I will try it next week for my family I think they will like it cause it looks good. This cake is exactly what we need for Thanksgiving dessert! Nothing beats a homemade pumpkin cake especially this time of the year! So delish! Such a fabulous cake! My family would LOVE it!! Sheet cakes are simply the best and this one sounds fantastic! I’ve been craving a cake just like this!